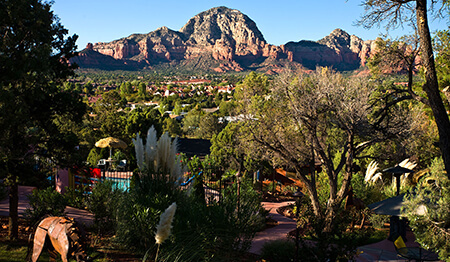 At the Chateau, we have beautiful gardens with many places to relax and unwind while enjoying glorious panoramic red rock views. 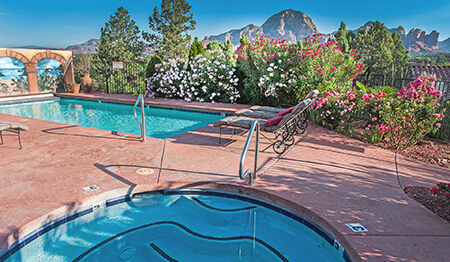 Enjoy incredible red rock views while relaxing in a chaise lounge or taking a dip in our salt water pool or jacuzzi. 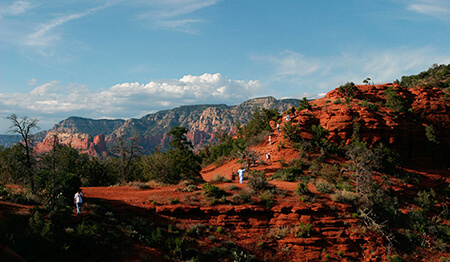 Enjoy one of many trails that starts just right across the street from the Chateau including a beautiful moderate hike where you will see almost all of Sedona. With beautiful red rock views and warm decorations in our conference space, you can host an unforgettable event that is a departure from the ordinary. At the Chateau, we have created beautiful spaces for you to relax and unwind. Take a dip in the pool, relax under the stars in the jacuzzi and enjoy the fireplace, or just lay down in a day bed and let your cares fall away. In addition to our gardens and salt water pool and jacuzzi on-site, there are two public tennis courts across the street from us. 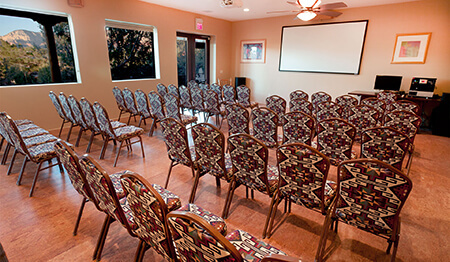 We also have conference space available on site for business meetings, retreats, family reunions or any other occasion.